4.0 out of 5 based on 43 bloggers and 3 commenters. 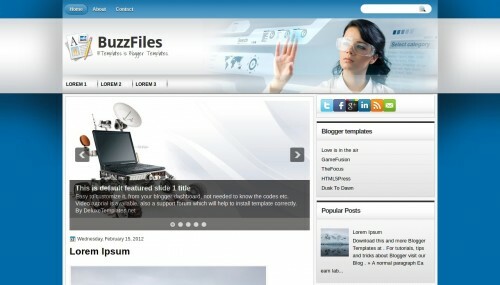 BuzzFiles is a free blogger template with 2 columns, right sidebar, slider and social bookmarking icons. Excellent template for blogs about business, internet, science or software. Can you tell me how do i remove the title image and plave my logo image instead of the book image????? The template is wonderful. I’m very saftify with it.